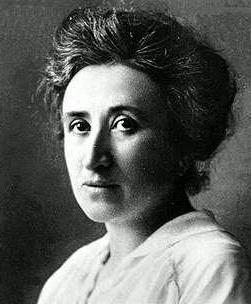 Rosa Luxemburg - What are the Leaders Doing? First Published: Die Rote Fahne, January 7th, 1919. Source: Rosa Luxemburg: Selected Political Writings, edited and introduced by Robert Looker, pp.291-4. Translated: (from the German) W.D. Graf. Transcription/Markup: Ted Crawford/Brian Baggins with special thanks to Robert Looker for help with permissions. Copyright: Random House, 1972, ISBN/ISSN: 0224005960. Printed with the permission of Random House. Luxemburg Internet Archive (marxists.org) 2004. In the fiery atmosphere of the revolution, people and things mature with incredible rapidity. Only three short weeks ago, when the conference of the workers� and soldiers� councils ended, it seemed that Ebert and Scheidemann were at the zenith of their power. The representatives of the masses of revolutionary workers and soldiers throughout Germany had surrendered blindly to their leaders. The convocation of the National Assembly from which the �people in the streets� were barred, the degradation of the Executive Council, and with it the councils, to impotent mock-figures � what a triumph for the counter-revolution all along the line! The fruits of November 9th seemed to be squandered and thrown away, the bourgeoisie once more breathed a sigh of relief, and the masses were left perplexed, disarmed, embittered and, indeed, doubting. Ebert and Scheidemann fancied themselves at the peak of power. The blind fools! Not even twenty days have gone by since then, and their illusory power has overnight begun to totter. The masses are the real power, the actual power, by virtue of the iron compulsion of history. One may put them in chains for the time being, one may formally deprive their organizations of any power � but they need only stir, only straighten their backs obstinately, and the earth will tremble under the feet of the counter-revolution. Anyone who witnessed yesterday�s mass demonstration in the Siegesallee, who felt this adamant revolutionary conviction, this magnificent mood, this energy that the masses exuded, must conclude that politically the proletarians have grown enormously through their experience of recent weeks, in the latest events. They have become aware of their power, and all that remains is for them to avail themselves of this power. Yes, it is a revolution with all its externally chaotic development, with its alternating ebb and flow, with momentary surges towards the seizure of power and equally momentary recessions of the revolutionary breakers. And the revolution is making its way step by step through all these apparent zig-zag movements and is marching forward irresistibly. The mass must learn to fight, to act in the struggle itself. And today one can sense that the workers of Berlin to a large extent have learned to act; they thirst for resolute deeds, clear situations, sweeping measures. They are not the same as they were on November 9th; they know what they want and what they should do. However, are their leaders, the executive organs of their will, well informed? Have the revolutionary chairmen and delegates of the large-scale concerns, have the energy and resolve of the radical elements of the USPD grown in the meanwhile? Has their capacity for action kept pace with the growing energy of the masses? We are afraid that we cannot answer these questions with a straightforward yes. We fear that the leaders are still the same as they were on November 9th, that they have learned little more. Twenty-four hours have gone by since the Ebert government�s attack on Eichhorn. The masses enthusiastically followed the appeal of their leaders; spontaneously and on their own strength they brought about the reappointment of Eichhorn. On their own spontaneous initiative they occupied Vorwärts and seized the bourgeois editors and the W.T.B. [Wolff�s Telegraphic Bureau] and, so far as possible, they armed themselves. They are waiting for further instructions and moves from their leaders. And meanwhile, what have these leaders done? What have they decided? Which measures have they taken to safeguard the victory of the revolution in this tense situation in which the fate of the revolution will be decided, at least for the next epoch? We have seen and heard nothing! Perhaps the delegates of the workers are conferring profoundly and productively. Now, however, the time has come to act. Ebert, Scheidemann, et al., are surely not frittering away their time with conferences. Most certainly they are not asleep. They are quietly preparing their intrigues with the usual energy and circumspection of the counter-revolution ary; they are sharpening their swords to catch the revolution unawares, to assassinate it. Other spineless elements are already industriously at work paving the way for �negotiations�, bringing about compromises, throwing a bridge across the abyss which has opened up between the masses of workers and soldiers and the Ebert government, inducing the revolution to make a �compromise� with its mortal enemies. Now there is no time to lose. Sweeping measures must be undertaken immediately. Clear and speedy directives must be given to the masses, to the soldiers faithful to the revolution. Their energy, their bellicosity must be directed towards the right goals. The wavering elements among the troops can be won for the sacred cause of the people by means of resolute and clear actions taken by the revolutionary bodies. Act! Act! Courageously, resolutely, consistently � that is the �accursed�duty and obligation of the revolutionary chairmen and the sincerely socialist party leaders. Disarm the counter-revolution, arm the masses, occupy all positions of power. Act quickly! The revolution obliges. Its hours count as months, its days as years, in world history. Let the organs of the revolution be aware of their high obligations ! Emil Eichhorn, a USPD deputy who became Chief of Police in Berlin in the November Revolution, was dismissed from his post by the SPD provisional government on January 4th because of his sympathies with the revolutionary Left.